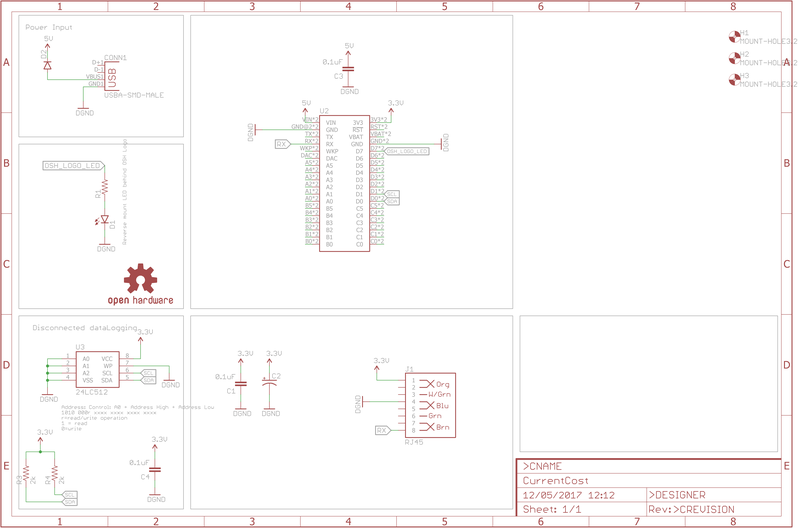 Optional - PCB or breakout board. 1 / 2 • Power monitoring with the ThingyStick Current Cost adaptor and Envir monitor. The Envir doesn't have built in Internet connectivity but Current Cost do sell a NetSmart module that plugs into the Envir, however this only sends the data to CurrentCosts own platform (my.currentcost.com), which leaves a lot to be desired, what I wanted was some way to get my electricity usage data to my preferred IoT platform (Tinamous.com - see my profile for one of the reasons why :-) ), and to use the power of the Photon to do some processing before sending the data. My initial prototype was with a breadboard and RJ45 breakout board. Simple Photon to Current Cost adaptor. This worked well but it's a little messy for a long term solution, so I threw together a PCB with a USB A plug on one end so it can be plugged directly into a USB power pack or hub. I added space for an EEPROM for additional storage should the device not have internet access and used the footprint for the Electron so either Photon or Electron can be used to monitor power usage. In the end I've left most of the PCB unpopulated, just the RJ45 socket, Photon and USB A Plug. For remote power monitoring (i.e. a farm building) the Photon can be swapped out for an Electron and the data transmitted over the cell network, however the current software is fairly noisy (sending every 5 seconds) so a bit more intelligence could be added to just send occasional power consumption and cumulative power. Using the Current Cost clamp, the inverter AC output power could be measured with this system to give an indication of the power generated from a solar array. Constructions is really simple, grab the Eagle brd file and submit it to OSHPark to have a PCB made, you'll get 3 nice purple PCBs for $20, solder on a USB A Plug and RH45 socket, add headers for the Photon (or solder it directly to the PCB if you prefer). Grab a RJ45 cable, I used a flat flexible one as that was easier, you don't need the twisted pairs, and connect the Current Cost Envir to your PCB. Being a software developer I've naturally over complicated the firmware..
During setup the USB serial port is enable for debugging and Serial1, the hardware serial port is set to 57, 600 baud for the current cost. a few buffers are reserved for reading and publishing messages and control of the onboard RGB led is taken for additional debugging. // via TX/RX pins for current cost. // Reserve space in the buffers. // RGB indication of publish. Here we see that channel 1 of sensor 2 is measuring 506 watts of power. In the loop function we keep a buffer of the message received as the full message may take a few loops to be received, then when we have both opening and closing elements (<msg>...</msg>) the message is processed. // to the main message buffer to be processed here. // Look for "</msg>" as the indication the end of the message has been read. // xml end terminator found. // to combines with future mesages. // Remove the string we are processing and anything we're ignoring before it. // ensure buffer contains the start terminator. // don't care about anything before that though. The processPower function extracts the data from this message, updates the stored sensor state and checks the appliances array to see if the power usage matches that of a known appliance. // Sensor may have upto 3 Channes of data. // but for now, just use channel 1. // -1 indicates channel data not found. // Build up the json string. // Only publish the sensor valur if it has a new value since last publish. This is then published using the Particle.publish method with the key "json" which allows Tinamous to pick up the measurements and process them. I've also defined a few appliances that the firmware knows about, such as the electric shower, this only shows on the whole house power, but it has a distinct power consumption, so when a change in power is recorded by the power usage (between 7 and 8KW), the shower state is updated. I've also defined dishWasher, washingMachine and kettle. These will obviously be different for different installations. It would be fairly pointless to make all this without some way to visualise the data, this is where Tinamous.com comes in. I added a ParticleBot from the bots page, this connects to the Particle device cloud and automatically imports all my Particle devices and assigns Tinamous devices to represent them, it then watches for events from the devices and parses well known events (such as the "json" event we published earlier). Tinamous will generate the fields automatically once data is published from the device, here we can see the fields, but I've edited the friendly name and units as "S1" isn't to helpful! I've also applied tags to aid grouping and to help with a dashboard. On the device page we can drill into the charts, below is my total (house) power usage for the 29 June. A spike at midday when I took a shower, and the air conditioner running from about 3pm (this week we are experiencing summer in the UK!). And naturally a real-time dashboard for seeing where all my electricity is going! I've not connected the tx pin of the Photon to the EnviR, I didn't think this was needed, however the result of this is the time is not set correctly on the EnviR. This was a nice and simple project to make, the hardest part turned out to be getting a photo of the EnviR LCD screen and trying to find something that would fit nicely into the Hackster project photo box! Send this to OSH Park to get your own board made. Paste this into a new App in the Particle build environment. No libraries needed. // Allows for a maximum of 12 sensors. // is active or not. // and appends it, so that it can split messages up. // The message being processed. // If the start of an xml element has been found. // usage so give an estimated time. // Time this trigger can be reset after. // the trigger should be reset after. // How long it was on for this time it was used. // from low power usage. // even when in a low power state so fall back to timeout. // If this measurement has been published. // Maxes out Particle.publish at 255 characters. // 2.5 hour wash cycle. // Consumes about 2 Watts when on, but not running. // needs to reset on -ve trigger. // Max 5 minutes run time. // Look for "</msg>" as the indication that the end of the message has been read. // Every n seconds publish the  value of the sensors. // not miss a sensor reading. // message will contain a history xml message. // TODO: Ignore delta's on reset. // If the appliance is for this sensor and is not already triggered. // the power no longer being drawn. // of the appliance. If so, reset the appliance. // TODO: Publish json status as well. // Get the id of the sensor being reported. // will also return 0. // Get the channel data for the sensor. // may have more channels if more than one clamp is fitted. // typical usage is ch1. // Indicate error with -1 watts for the channel. // Watch for serial data on the Tx/Rx serial pins.